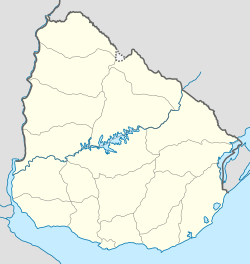 Villa Aeroparque is a small town or urban fragment (fraccionamiento) in the Canelones Department of southern Uruguay. The town is located on Route 101, 4.5 kilometres (2.8 mi) northeast of its intersection with the Ruta Interbalnearia and the Carrasco International Airport. It is part of the wider metropolitan area of Montevideo. In 2011 Villa Aeroparque had a population of 4,307. ^ "Censos 2011 Cuadros Canelones". INE. 2012. Archived from the original on October 10, 2012. Retrieved 25 August 2012. ^ "Censos 2011 Canelones". INE. 2012. Archived from the original on September 7, 2012. Retrieved 28 August 2012. ^ "1963–1996 Statistics / V" (DOC). Instituto Nacional de Estadística de Uruguay. 2004. Retrieved 13 July 2011. This article about a place in Canelones Department is a stub. You can help Wikipedia by expanding it. This page was last edited on 22 March 2017, at 17:34 (UTC).